The woman dated the man for about two years. She ended the relationship after she learned about her lover’s lengthy Criminal Record. Ask yourself, what kind of person would hide another life, from someone they were in a long term relationship with? When their relationship was ended by the female, the male (as per the article and apparently per Police Documents) had informed her that was going to kill her. This is someone this women spent two years with. Some people do not like being abandoned. What kind of person might that be? It is a sad read, but just might provide some insights. Click on this link to visit The Washington Post website to read the article. Girlfriend leaves him. She returns to his apartment to talk. He tortures, mutilates and kills her. Then drains her body of all it’s blood. Blake and his brother came from a wealthy family. His brother Cody went into Real Estate development, like his Dad. Two males from the same family, but with vastly different life choices. Wonder why? Early in May 2016 Blake and his girlfriend Iana Kasian became parents. Later the same month, on May 20 Blake was charged with Sexual Assault (against another unknown female) and released on Bail. A month or two before and after the birth of a baby all focus is on “the Baby“. News reports say that when Iana found out about the Sexual Assault charge, that she moved herself and her infant daughter out of Blake’s apartment to live with her mother. The story hit the AP Newswire. Because it’s copyrighted I can’t post it. There is already a YouTube video which has someone reading the AP report. The Mail Online site did some further research and included photos of the female and her “ex”, which were not part of the AP News Feed. Note the quote “didn’t accept being abandoned” (my quoting a few words out of hundreds for education purposes falls under “Fair Use” and I am quoting from the AP post). Interesting choice of words. It must be the victims fault. If she had not abandoned the guy, he would not have burned her alive. Somehow to them, it is always the fault of the victim. In essence, the Ex followed the victim. Ran her car off the road. Got access to her car interior, while the victim was still in it. Poured alcohol into her car and lit it with a lighter. The victim left her now burning car. The Ex caught up to her. Threw alcohol at her head and lit it. She died from her burns. All that because the Ex “didn’t accept being abandoned”. He sure won her back, did he not. Such a thing happening once, is one time too many. Yet this kind of thing sadly happens. Click on this line to visit the Mail Online (British News) site to read their news article about this. People who have suffered Attachment and Abandonment Trauma when they were infants, can become very disordered adults. To suffer an Abandonment Trauma Event as a adult could send the person in two directions. One is to become suicidal over being abandoned. 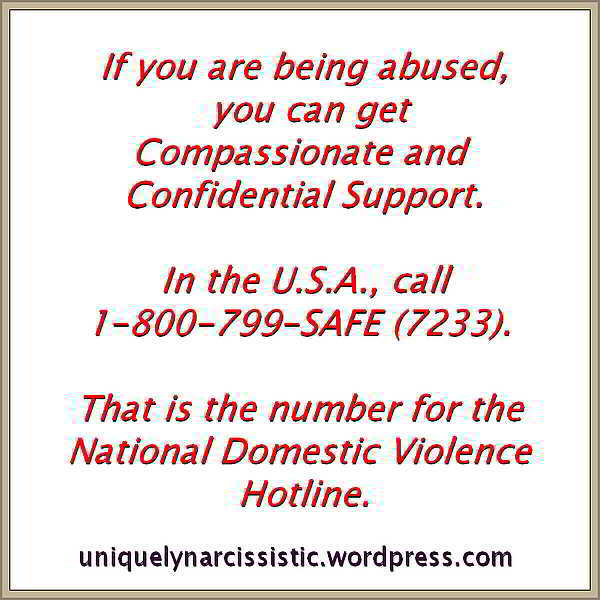 It is real, I’ve seen two somatic female Narcs go that route – both survived. The other direction is to destroy the person who abandoned them (as in the news article). It comes down to the destruction of self or the other person. Someone has to pay, it’s either me or them. Disordered people have limited choices, especially those at the extreme end of disorders of Narcissism, and Sociopathy. Psychopaths, it is my understanding, would not suffer an Abandonment Trauma Event like say a Malignant Narcissist would. A Psychopath will kill you, because they want to kill you (no excuse needed to motivate them). Learn the Red Flags to watch out for. If you don’t become involved with a Disordered individual, then you cannot abandon them. You become a non-issue to them, as they have a number of targets lined up to become potential sources of Narcissistic supply for example. Click on this line to read the NY Post article about this event. The Mail Online article has more detail and photos – see the link further up in this post. There are many Red Flags given off by Narcissists. Love Bombing for one. Mirroring is a big one, which I tend to consistently harp on about. There are a couple of key things which the Narcissist will not hide from you. One is in my opinion the “most important Red Flag“. Ask the potential Narcissist about their childhood. Were they brought up by their Birth Mother? If they were still an infant and they were adopted out or given to other family members (say Grand Parents) to be brought up, that is the “most important & biggest Red Flag“. To better confirm that Red Flag, ask questions about the person’s Birth Mother? If there is any animosity or even outright hatred shown towards their Birth Mother, that is “yet another major Red Flag” which also confirms your perception of the biggest Red Flag. It is my opinion that Narcissists are created due to Abandonment Trauma(s) suffered while still an infant, before the left hemisphere of the brain is developed. The Trauma(s) change how the Brain Develops – ie it’s a Hardware-Wiring issue and so Narcissists can not be changed via a treatment protocol. MRI Brain Scans seem to confirm “my opinion”. Joseph Burgo, in a radio interview, alluded to the coincidence that many diagnosed Narcissists had been abandoned in their early childhood. They were adopted out. They were transferred to other family members (Grandparents) to be cared for. All the Narcissists who I got to know, had issues with their Mother. Yes the issues varied between a coldness to outright disdain. “Underneath this colourful maelstrom lies an hypothesis: pathological narcissism is the direct outcome of early childhood abuse and trauma, mainly in the form of abandonment or neglect. Narcissism, in other words, is a defense against hurt and emotional injury.”. A female Somatic Narc had a pronounced dislike of her Mother. In stark contrast, she and her Dad were fine. Events in the past when one is an infant can have profound affects which can last a lifetime. A Cerebral Narc would not speak to their Mother when she came in tears because her own Mother had just passed away. The Cerebral Narc’s Grandmother dies and the Narc could not be bothered to come and talk and try to comfort their own Mother. . Would a non Cluster-B Disordered Individual, who has Empathy for the suffering of others behave that way?. Being brought up by other family members like Grand Parents can cause Abandonment Trauma. To the Grand Parents it’s a burden to “have to” feed, cloth and bring up their daughter’s infant child. They already brought up their own kids. The distrust of the Birth Mother for being abandoned and sent off to live with strangers (yes they are Grand Parents and an adult understands that but an infant sees themselves being dumped off to some strangers) by the Narc can be life long. Different people love very differently and sadly some not at all. That description includes Grand Parents. The infant had already lost life’s lottery by being born to a Mother who abandoned them and sent them away to live in another place. Good chance that the Grand Parents were not the kindest and most loving of individuals. So the infant losses again and possibly pays for such loss by developing a Personality Disorder which could prevent them from being able to establish and enjoy “Intimate and Loving” relationships. Alice Miller has written a post on her site which ties a number of things together. Her post is titled: “The Ignorance or How we produce the Evil”. I’ll have some quotes below, from that Alice Miller post. As Alice Miler stated “Children have nothing else to go on but their own experience”. If the infant child experienced Abandonment Trauma they they will not know how to Love someone. They will do to someone else, what had been done to to them. They will use them and abandon them. 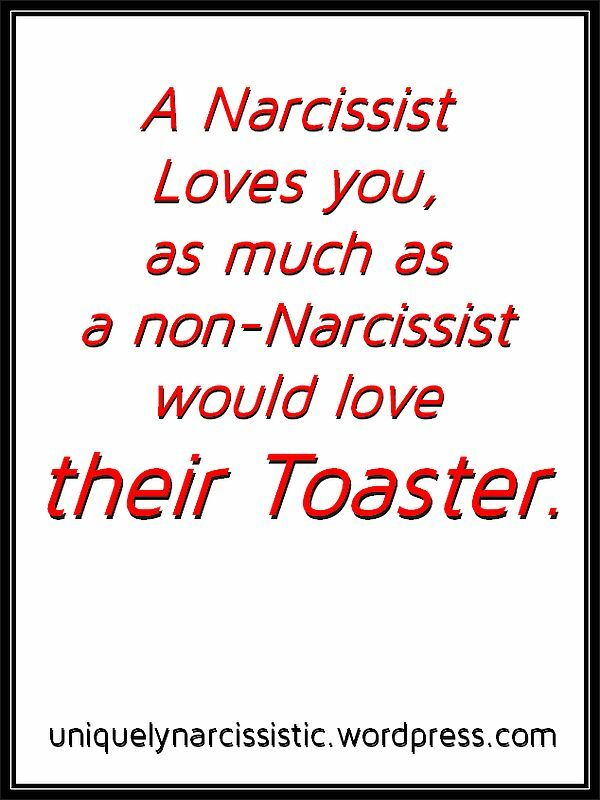 It is my opinion, that It is not the Narcissist’s fault for developing such a Personality Disorder. It is up to you whether you want to get involved, in any kind of a relationship, with a Personality Disordered individual. So recapping the two biggest and in my opinion most important Red Flags of a Narcissist. If you learn that the person was not raised by their Birth Mother that is IMHO the most important and biggest of all the Red Flags. Major issues with their Birth Mother is another confirming major Red Flag. The more Red Flags that you can spot, the higher the probability that you are interacting with a Personality Disordered Individual. Watch for the Red Flags. Brain Scans of Human Brains under the influence of LSD. Might LSD rewire the Brains of Narcissists allowing them to experience Empathy for others? The videos below discuss Brain Scans of Human Brains under the influence of LSD. LSD is apparently being tested to help those suffering from Psychiatric Disorders such as PTSD. I wonder if LSD could help “repair” the childhood trauma of Abandonment which seems to be a common factor among Narcissists. It might be able to rewire the brain and permit Narcissists to experience Empathy for others.